Klickitat County draws birders from all corners of Washington State, and Rock Creek Road is a ''must'' on any tour through this area. Rock Creek drains water from the ridges and plateaus of central Klickitat County into the Columbia River. Late spring is an ideal time to visit, before the summer heat and drought dampen bird activity throughout most of the day. As a continuous water source, Rock Creek attracts abundant bird life. The brushy riparian vegetation (alder, black hawthorn, willow, red-osier dogwood, cottonwood, and many non-native species), dry hillsides, and canyon walls provide nesting and feeding habitat for a variety of birds. As Rock Creek nears Route 14, the road parallels a sheltered inlet of the Columbia River. Two specialties of Rock Creek Road are Ash-throated Flycatcher and Yellow-breasted Chat, which are easily located in this riparian corridor. Western Wood-Pewees, Lazuli Buntings, and Western Kingbirds are also common. Canyon Wrens and Rock Wrens vocalize from the rocky canyon cliffs. Golden Eagles and American Kestrels may be seen. Warbler possibilities are numerous, especially in migration, and include Yellow-rumped, Townsend's, Nashville, MacGillivray's, Yellow, Orange-crowned, and Wilson's. Lewis's Woodpeckers and Downy Woodpeckers may be found. This is one of the few areas in Eastern Washington where Common Bushtits occur. Near the Columbia, shorebirds, ducks, and gulls may be found. 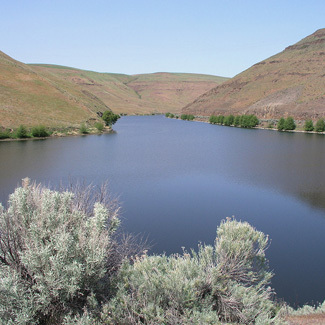 From Route 97 in Goldendale, take the Goldendale-Bickleton Road east for about 15 miles. Descend to Rock Creek via a long switchback. At the junction with Rock Creek Road (gravel, in good condition), turn right and stop frequently along the road. (Please respect the private property on both sides of the road.) Eventually the road intersects with Route 14 at the Columbia River. By continuing east on the Goldendale-Bickleton Road, one can easily visit the famous Bickleton Bluebird Trail. Warning: Rattlesnakes may be encountered in this area.